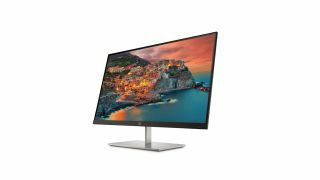 At CES 2019, HP announced its 2019 monitor lineup, with the new Pavilion 27 Quantum Dot display at the forefront. This QHD (2,460 x 1,440) monitor will feature unique Quantum Dot technology, which uses micro-crystals to generate images, and as such, its remarkably thin, measuring just 6.5mm. And, it's not just the thickness, the Pavilion 27 Quantom Dot has an ultra-thin, three-sided micro-edge display that virtually eliminates bezels. All of that wouldn't mean much if the panel technology wasn't up to par, and thankfully it is. HP is using Samsung's PLS technology, which is similar to IPS, but should theoretically lead to even better viewing angles and brightness. And, since it covers 90% of the DCI P3 color gamut, it should be quite color accurate as well. Combine all that with the AMD FreeSync compatibility and a low blue light filter, and the HP Pavilion checks all of the boxes of a high-end monitor. The HP Pavilion 27 Quantum Dot display will be available in March 2019, and will set you back $399 (about £310, AU$560). HP didn't just announce the Quantum Dot display at CES, but a whole line of new monitors from the FHD version of the HP Pavilion 27 to the gigantic HP Omen X Emperium 65. The HP Pavilion 27 FHD is a 27-inch FHD (1,920 x 1,080) IPS monitor, with 250 nits of brightness, covering 94% of the sRGB color space. It will also have USB-C compatibility, with the same Micro-edge bezels as its Quantum Dot companion. This FreeSync monitor will be available in March for $329 (about £360, AU$460). Then, there's the HP Pavilion 32 QHD display, which is 32-inch, 2,560 x 1,440-pixel monitor, also with FreeSync and a blue light filter. It doesn't have the same narrow bezels as the other monitors in this lineup, but with 100% of the sRGB color space it shouldn't matter too much. If 32 inches is too big for your desk, it will be equipped with standard VESA mounting, too. It will be available in June for $379 (about £300, AU$530). If you're on the market for a new gaming monitor, HP has you covered with the Omen X Emperium 65 – a massive 65-inch gaming monitor with G-Sync technology. And, with a 4K UHD (3,840 x 2,160) resolution, HDR 1,000, and a high refresh rate of 144Hz, you're going to need an incredibly powerful Nvidia Turing card to drive it. But, even if you don't have room on your desk for a 65-inch monitor – we don't either – it comes with Nvidia Shield streaming technology, a sound bar and smart TV apps built in. If you're ready for a gaming monitor of this caliber, you can pick it up in February for $4,999 (about £3,950, AU$7,070).